Ten days ago a friend of mine took his own life. 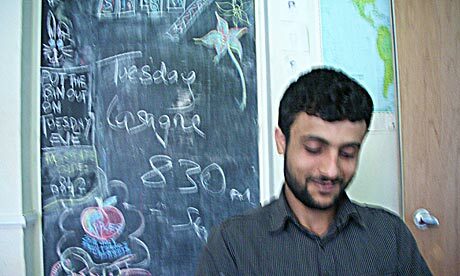 His name was Osman Rasul, and he was a warm, kind, respectful man. I first met Osman almost exactly six months ago. Sitting in a noisy bar I watched him walk in, hooded against the January cold and hat pulled low over his eyes, carrying a small rucksack with his few possessions inside. He sat with us and smiled sheepishly as another friend explained his story: how he had arrived in Nottingham with nowhere to stay, no money and no contacts to call on. How he had slept rough in the depths of winter and woken frozen almost stiff. How he had eventually found his way to a refugee support organisation and been given a place to crash temporarily, and how he was in need of a more permanent place to stay. Looking at him I saw a face that had lived through many, many hardships, but still shone with the smile of a good person. And so, there and then, my housemates and I welcomed him to our home. Over the three months that he lived with me I heard more stories from him: of the murder of his father and brother by a militia in Iraq, and his fear for his own life; of his journey to the UK in the hold of a ship, and his impossible struggle to prove his origin and identity when he had arrived with nothing; of his arrest and imprisonment after a false accusation, and his bitter disbelief when he was acquitted, a year later, to be thrown back out on the street with no life to go back to. Living with Osman I saw firsthand the spirit-crushing inhumanity of the British asylum system, and how unremittingly bleak life can be for those who are left in limbo. Prohibited from working, with no access to housing or financial support after his first claim was rejected and still awaiting further documents to make a fresh claim, he was left destitute, forced to rely on the charity of others to his continual chagrin. His life was governed by an interminable waiting: for meetings with solicitors, for correspondence from the Home Office, above all for an end to the paralysing uncertainty in which he had lived for the best part of a decade. Still, he fought a daily struggle to build a life on the most uncertain of foundations, taking any odd jobs he could find to pay his own way in our household, visiting friends, growing herbs in an allotment or exploring the city by bicycle. About a month ago we received a letter explaining that Refugee and Migrant Justice, the outstanding refugee-specific legal firm who were handling Osman’s case, had gone into administration, bankrupted by the Government’s refusal to pay for work done in a timely fashion. The thought of starting again from square one of the process, finding a new solicitor, undergoing another round of interviews, statements and still more waiting, was almost unbearable. His mental health, which had shown signs of fragility, started to decline; desperately searching for some kind of resolution he made a trip to the capital, hoping to escape the labyrinth of soulless bureaucracy and to confront the Home Office directly, to be recognised, for once, as a human being by a system constructed without humanity. There, at the climactic moment of his journey, he was met once again with wintry indifference. And at that point the light at the end of the tunnel, which had kept him going for so long, flickered out. There is a huge political battle which must be fought for the rights of refugees, migrants and asylum seekers in Britain. Collectively they have become some of the most demonised minorities in our society, flimsy spectres that can be hauled into the public eye to provoke, and then absorb the vitriol of a populace growing ever more discontented with the status quo. But for myself and those who knew Osman Rasul, today the bigger political picture is just the ugly backdrop to an intensely personal ritual: mourning the loss of a friend. Further coverage of the story in the Guardian can be found here. Corin Faife is a writer and activist. His ‘Modern Times’ column appears in Ceasefire every other Tuesday. Thank you for sharing these heartfelt words. These stories too often go unheard, there are thousands of people suffering because of our immigration system and immigration detention is said to be of the worst. I pray that cases like Osman’s are used to bring about change – some level of justice.